We’re heading into holiday season! Which means a LOT of time in the kitchen. I truly love all the baking and cooking, but it’s so much more enjoyable with the right tools. Four of five of these are my go-to fav’s at home – so much so that a few are starting to show some wear. 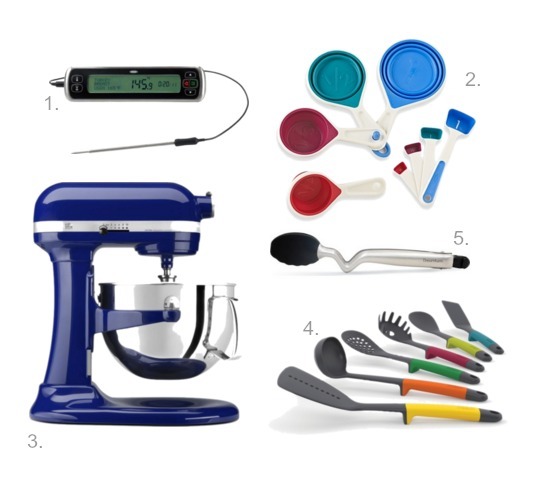 If you’re looking for the right gadgets to get set for the holidays, these might be just what the head chef ordered. If you make meat, go into your gadget drawer. 1.Throw out your meat thermometer. Get one of these. It’s the OXO Good Grips Chef’s Digital Leave-In Meat Thermometer. Love the OXO tools but this one is my fav. It really is awesome. It’s embarrassing to admit that I have a bit of a measuring cup/spoon problem. 2. I have a number of sets. These ones are my go-to. They are the Chef’n® SleekStor™ 8-Piece Collapsible Measuring Cups and Spoons Set. The spoons are particularly awesome. And I love how the cups collapse to take up less space in my messy, messy kitchen drawer. You can order them in Canada from Bed, Bath and Beyond. This one is an icon. 3. The KitchenAid Stand Mixer. 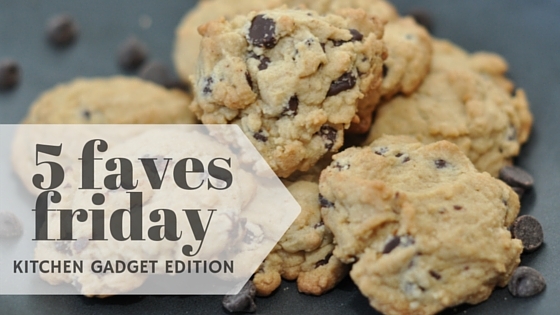 If you bake and don’t have one, you should put it on your wish list. I know, it’s pricey. But it really is the gold standard. I can’t imagine making it through holiday baking, birthday parties, fundraiser cupcakes, waffle mornings and life in general without mine. I love these tools that sit up on their own and keep the goopy end off the counter. 4. They are from JosephJoseph but I get mine at IQliving. I have a few and would love the rest of the set. I love the grips, I love how easy they are to care for and I love that they have one for every task. Excellent stocking stuffer. This last one is the product I haven’t tried but is def on my Wishlist. 5.These Dreamfarm Clongs look awesome. This brand out of Australia has all kinds of neat stuff. I picked these because I use tongs A LOT and these look comfy to hold, seem to be the right length for tons of different kinds of dishes and they are also make to keep the goop off the counter. I hope to find them somewhere soon. Can’t wait to try them.